I’ve been a fan of The Three Stooges ever since I was a kid (back then, their short films played on a local Philadelphia station five days a week), and have wanted to include them in this challenge of mine for a while now. The question, though, was how would I do it? Would I attempt a retrospective covering the trio’s entire history (which would have been a gargantuan undertaking), or simply choose a single short movie to write about (which always struck me as woefully inadequate). In the end, I decided to break my coverage of the group’s cinematic output into two sections: The Curly Years (1932 to 1946, when Jerome “Curly” Howard was part of the trio) and The Shemp Years (1946 to 1955, when Shemp Howard, who was one of the original stooges during their vaudeville days, rejoined the group when Curly became too ill to continue). For the time being, I have no plans to expand this coverage to include Joe Besser or Curly Joe DeRita, whose contributions were far more limited. Like many fans, Curly was always my favorite Stooge. From his odd ticks and bizarre noises to the way he usually made a bad situation even worse, Curly was the most likable of the group, a dim-wit who was regularly abused (cinematically speaking, of course) by older brother Moe Howard. Joining the Stooges in 1932, Curly would appear, along with Moe and Larry Fine, in over 100 short films. 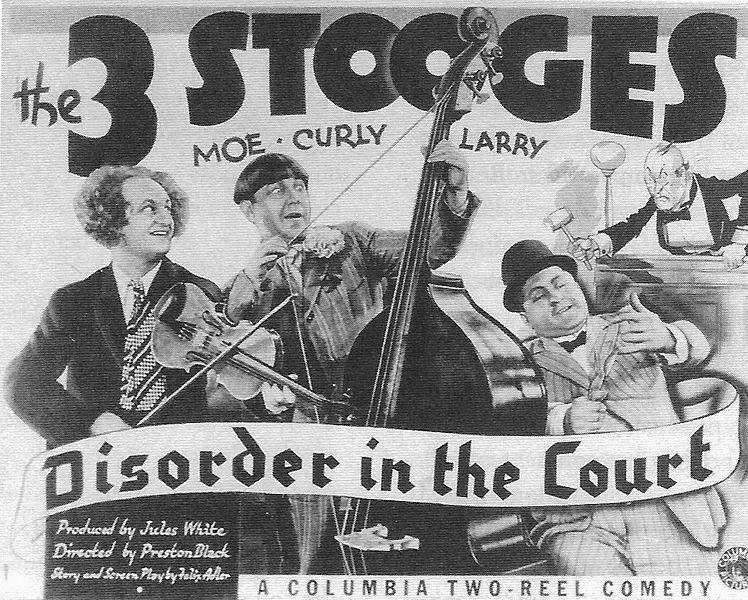 For the sake of brevity, I’ve decided to look at three of them: 1936’s Disorder in the Court, where the boys make a mockery of the U.S Judicial system while trying to help singer Gail Tempest (Suzanne Kaaren) beat a murder rap; Violent is the Word for Curly (1938), in which the Stooges pose as a trio of college professors; and another case of mistaken identity, A Plumbing We Will Go (1940), where Moe, Larry, and Curly pretend to be plumbers, with disastrous results. There’s plenty of physical humor in all three of these films, with Moe taking his frustrations out on Larry and Curly by way of the occasional slap to the face, or the odd eye poke (in Moe Howard’s autobiography, he claims that, in all the years they were making movies, he never once actually poked a co-star in the eye). 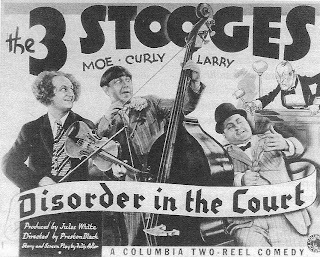 Yet not all of the humor centers on violence; in Disorder in the Court, there’s a scene where Curly, sitting on the witness stand, tries to explain what really happened on the night in question, using plenty of slang as he does so (“We were tearin' up some hot swing music in the York Esther”). The Defense Attorney (Bud Jamison) tells Curly to speak plain English, and “drop the vernacular”. With no idea what he's talking about, Curly looks down at his hat, which is sitting in his lap, and says, “Vernacular? That’s a derby!” Violent is the Word for Curly even features a musical number in which the boys try to teach the alphabet to a class of college students, and in one of the trio’s most famous routines, Curly accidentally traps himself in a maze of pipes while attempting to fix a leak in A Plumbing We Will Go (according to Sam Raimi, a scene from this short, where a light bulb fills up with water, inspired a similar sequence in his 1981 classic, The Evil Dead). Sure, violence was always a key element in their humor, but the Stooges could do plenty more besides. The "Curly Era" officially ended in May of 1946, when Jerome Howard suffered a major stroke on the set of Half-Wits Holiday (going back once again to Moe Howard’s autobiography, he claims he walked into Curly’s dressing room to find his younger brother slouched over, unable to speak). And while he would make the occasional effort to return to the group (he had a cameo in 1947’s Hold That Lion, making it the only short to feature all three Howard brothers), his health continued to deteriorate until his untimely death in 1952 at the age of 48. It was a sad end for the most popular Stooge, but not the Stooges themselves, who would press on for years to come.